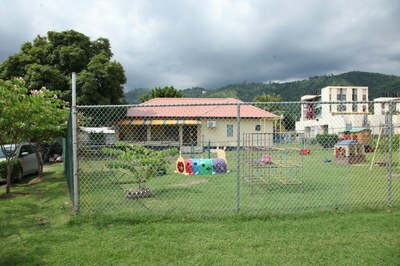 Cynthia Shako Early Childhood Education & Day Care Centre — UTech, Ja. The goal of the Day Care Centre is to positively and systematically influence all aspects of the development of the young children placed in its care while allowing their parents to continue their education and carry out their duties with confidence. The Cynthia Shako Early Childhood Education and Daycare Centre, certified by the Early Childhood Commission, offers exceptional daycare service to children 3 months to 3 years old and aftercare for children ranging from 3 years old to 8 years old. The Summer School programme facilitates children 3 years old to 10 years old. The Daycare service is available to the students and staff of the university while the Aftercare and Summer School programmes are opened to the wider community. The Cynthia Shako Early Childhood Education & Daycare Centre was established in 1993. The Centre is the brain child of former staff of UTech, Nurse Cynthia Shako who saw the need to have such a facility to benefit students who needed to have their young children in care while they attended classes. The programme soon grew to facilitate staff members and now caters fully to all staff and students of UTech. Ja. The Centre is open Monday to Friday, from 7:30 a.m. to 6:00 p.m.